Like Dylan in the movies. Robert Mitchum stars as a former private detective whose old life comes back to haunt him in director Jacques Torneur’s noir thriller Out of the Past. J. – Let’s just start with the basics — I loved this movie! You know, we’ve put up enough of these yammers to notice a pattern in my writing: start with my overall thoughts and then add the inevitable “but”. Not this time. There is no “but”, I just enjoyed the film thoroughly and I feel like it hung together extremely well from start to finish. So what to do now that I have nothing but good things to say? It almost takes a bit of fun out the process, but I suppose there is a way to effectively and engagingly criticize through praise. I suppose the thing to start with is the dialogue. Totally dug the exchanges in Out of the Past. I generally have a soft spot for noir language. I’m a big fan of Dashiell Hammett’s writing and have deeply enjoyed the couple of Raymond Chandler novels I have read. And noir dialogue might be even better in the movies, be it Humphrey Bogart’s smirking put downs in The Big Sleep or the fey yet sexually charged banter in a film like Otto Preminger’s Laura (not on the list, but awesome nonetheless). But there’s no escaping the fact that most film noir dialogue is heavily, heavily stylized — it’s one of its strengths, but also can lead to something akin to self-parody. Out of the Past isn’t like that. It has the devasting one-liners and the hardboiled speak, but it feels much more lived in and serious. I have a hard time deciding whether that is due to the script or the performances — or both — but I found it really appealing to bring a certain measure of naturalism to the character interactions while amping up the stylization of the visuals (at least when compared to Bogie’s private detective flicks). S. – The dialogue is snappy and devastatingly smart, yet delivered with such understatement that it is in danger of sliding right by you before you notice the barbs. The utter coolness of Mitchum as Jeff is compelling to watch, he is not trying to prove himself to anyone, he already knows people cannot keep up. Initially his detached manner seemed out of synch with the surrounds and lifestyle we are first introduced to, although it soon becomes apparent that he is a man with a dark past. In keeping with his character it is not with panic or aggression that Jeff responds to the collision of worlds, rather a sense of inevitability that he never really deserved to escape its clutches. Before we even meet Jeff a number of scenes cleverly begin to sketch his outline in the small town he is presently residing in. A gossip at the coffee shop airs her disapproval that he has turned the head of local girl Ann (Virginia Huston) mark him as an outsider. The wholesome young man Jeff has hired to work with him at the gas station is deaf and dumb, ideal for preventing too much information slipping out should a thug stop by (the scene also brilliantly illustrates the clash between the lives Jeff has been leading). These small details represent fault lines that are about to give way, tantalisingly set the stage for the backstory that connects Jeff Bailey to Jeff Markham and Torneur does not disappoint. 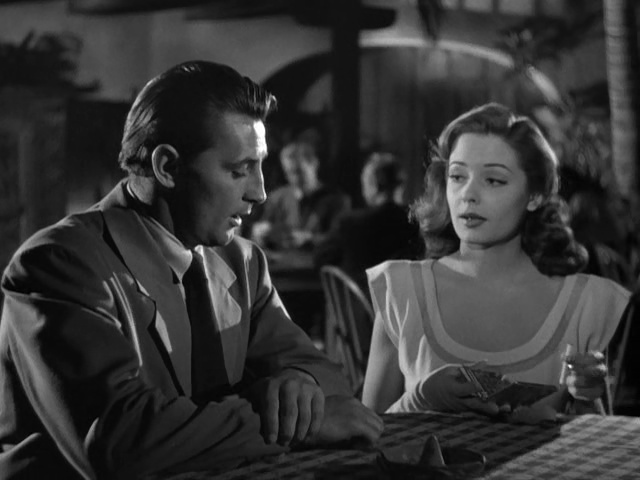 Jane Greer turns on the charisma and the desperation as the traitorous Kathie, serving as an ideal foil to Mitchum’s disillusioned Jeff. The two actors have a wonderful chemistry that convinces the audience that they still cling to a connection that should have been decidedly severed. J. – Yeah, I really like that the movie has these eccentric touches like the deaf kid but manages to utilize such characters in believable and interesting ways. And the same goes for Robert Mitchum’s character, who also seems rather eccentric and unwilling to play strictly to type. See, I don’t think that Mitchum’s Jeff is a supremely confident character. He is frequently rather awkward and seems keenly aware of his failings and weaknesses. Compare Jeff to Bogart’s Phillip Marlowe. Every woman that Marlowe comes across falls for him and he is effortlessly on the ball with the right thing to say to further his aims. Jeff isn’t like that — he struggles to hunt down Kathie (Jane Greer) and his passes at her are awkward and almost desperate — Kathie even later says that she found his terrible flirting to be endearing. But I think he does have confidence in that sense of inevitability you mentioned. Jeff’s frequently smart enough to see the traps that are set for him, but a bit too fatalistic to simply run the other way. I’m never sure if Mitchum’s character feels like he can actually beat the forces out to get him, or if he is just resigned to letting destiny take its course — goodness knows little actually turns out well for him despite all his planning and insight. I really liked that aspect of the film a lot, in no small part because I really couldn’t predict exactly where the movie was going to head. In The Big Sleep, for example, no matter what kind of scrape Bogie might have found himself in, you knew he was going to be victorious in the end. That was never the case in Out of the Past, and I think Mitchum’s strong but low key take on the noir hero was a big part of that. He portrayed a man that you could easily envision as the victor or the loser in a dangerous game. How do you know it’s a noir film? Shadows! 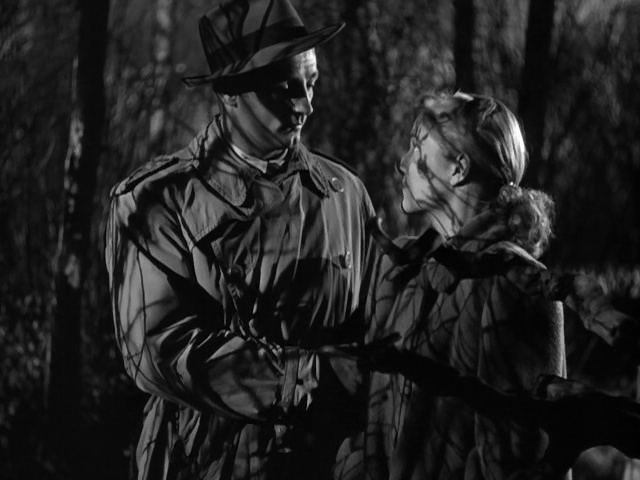 Out of the Past has some of the darkest and best-used shadows of any noir picture. In this sequence, the crosshatching shadows highlight the turmoil that the two lovers are experiencing as fate works its damnedest to tear them apart. S. – The vulnerability of the lead is a huge part of the appeal to me. Unlike the other noir films I have seen it never feels like a game between a couple of clever thugs where you already know your guy will eventually come out on top. Jeff rarely seems to be in control, nor does he give the impression that he has everything figured out. Sure he can string together a few pieces of the puzzle but a massive blindspot, in the form of Kathie, means he is never truly ahead of the game. Full credit to Mitchum for bringing an intriguing fatalism to Jeff that pulls you along with his plight rather than frustrates you with his poor choices. Even though you know that his instincts are often wrong, the fact that he can see no option other than following them manages to make Jeff endearing. Kirk Douglas is also terrific as nemesis Whit Sterling. The rapport between Jeff and Whit on screen is always entertaining, they seem to enjoy butting heads. At first it seems like these two are equally matched in savvy, yet as events unfold it becomes apparent that their mutual blindness to the threat that is Kathie is their biggest problem. The audience is given hints at Kathie’s duplicity that Jeff and Whit are incapable of taking seriously, the twists and turns that occur during the last third of the film are all entirely believable because of the careful groundwork that is laid. Kirk Douglas takes a very unusual tack in portraying the film’s fearsome crime boss, being the most cheerful and friendly character in the movie. It’s an inspired choice, as the smiles and professions of confidence actually make his character both more sinister and more believable. J. – Kirk Douglas is excellent as the villainous Whit. He’s a very compelling bad guy, as he is in no way a moustache-twirler or a heavy. Indeed he looks like, well, Kirk Douglas and is quite affable and engaging, which only serves to make the character that much more menacing. It’s a great performance, and unlike any I’ve seen from Douglas, given that I have only seen him in hero roles. 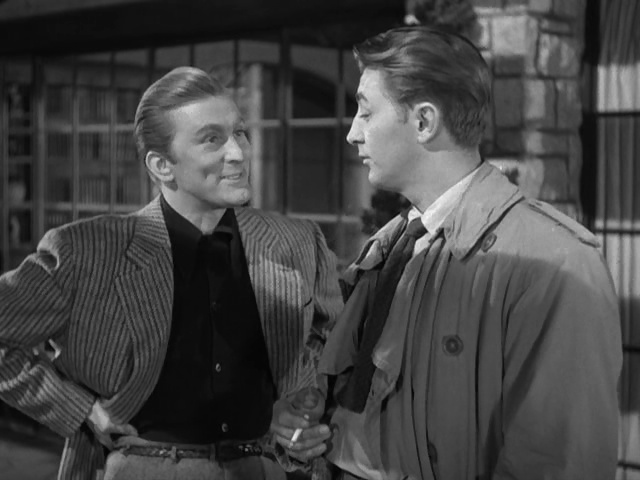 And Whit’s sunny posturing does set up some very engaging confrontations with Mitchum’s Jeff, having the two men carefully select words that appear off topic or innocuous but are basically verbal body blows. But I think the performance of the film might have to go to Jane Greer as the nefarious Kathie. It’s a real tightrope-walk of a role to make her a self-centered betrayer of the highest order but still able to convince the audience that the two men in her life would be willing to risk her company. I really like that Kathie is ultimately unredeemable, but not evil, per se. This applies equally to the conniving Meta (a coolly devious performance by Rhonda Fleming), as the two women do what is necessary to get by as best they can, and won’t let the men in their lives determine their fates. And both actresses — Greer in particular — give performances that are loaded with nuance and strength. But I want to get back to the point we’ve made about Out of the Past being different from other noir films. I’m sure some readers would note (correctly) that noir protagonists often fail, indeed the genre gets much of its gritty reputation from the propensity of the protagonists to meet their doom. But I feel like most noir films with doomed protagonists have that feeling from the beginning — they are fated to fall, the film then is about tracking how that fall comes to be. Out of the Past grapples with these questions of fate, but I never felt like Jeff’s ending was obvious until the closing moments. There are many aspects to this unpredictability that we could discuss, but one I’d point to is the look of the film, which I think offers much more light and hope than many noirs. Most of these kinds of films take place at night or in grim cities or confined, claustrophobic environments. But Out of the Past is not like that. Yes, it has its deep shadows and grim doings (some of deepest and grimmest of any noir), but it also has scenes set in beautiful countryside or on Mexican beaches. And these broader spaces allow for the camera to roam more freely, and Torneur very frequently has his camera in motion throughout the film. It’s generally a much more open world than the rainy LA of The Big Sleep or the train cars and offices of Double Indemnity, which I think presents glimmers of real hope in a hopeless situation. And I really dug the balance of tones and settings on offer. 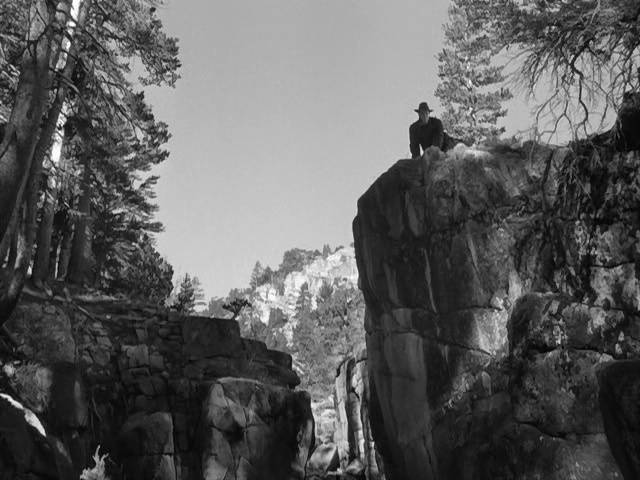 Unlike most noir films, Out of the Past spends quite a bit of time off the hardscrabble city streets in more picturesque natural locations, a choice that opens up the scope of the film and ultimately makes the story feel less predictable. S. – The outdoor vistas are beautiful and add to the naturalistic feel that inhabits the film. The tawdry private eye business Jeff is entangled within takes place in the real world. It is not all dark alleys and glitzy hotels. While the classic noir elements of violent chain-smoking men and gorgeous trouble-seeking dames are still there, they are inhabiting a larger world. A world with opportunities and consequences beyond besting the resident tough guy. Certainly this provides some hope as you suggest, J., yet it also emphasises the difficulty such characters have fitting back into regular society. The ambiguous ending invites you to consider whether Jeff had succeeded in bridging the divide. I loved Out of the Past. The cinematography is first-rate, the characters have depth as well as sass and the story twists you all about without ever feeling as though it is just playing games with you for the hell of it. Finally a chance to give a little shake to my Top 10 list. J. – Make that our Top 10 lists! Thanks. It’s a wonderful haunting film with a staggering performance from Mitchum. Regards Thom.